Our main group activity is a weekly interval training session on Wednesday nights. A typical workout is 6 x 1,000m. On the last Wednesday of the month we do a 5,000m time trial. The weekly turnout is generally 60-80 people (men and women, foreigners and Japanese) ranging from quite fast to getting fasterrunners, divided into two groups. The training is at a nice all-weather track located between Harajuku and Shibuya. Men’s and women’s locker rooms with showers are available. The workout starts 7:30, arrive earlier to warm up. After the workout we go to Shibuya for dinner. In the late 1980s, a group of foreigners (Irish and Americans) were getting together once a week to train with a Japanese running club. As the group included several very strong runners, in 1989 they decided to enter an ekiden. Ekidens are very popular in Japan and some of the more popular ones have over 100 teams competing. The two teams of gaijin (foreigners) drew quite a bit of attention, particularly as the A team finished 3rd out of 187 teams. Flush with success, another ekiden was entered, the highly competitive Okutama Ekiden, where the A team finished 4th among 120 teams, with three of the runners recording the second fastest times on their segments. The following year, the team finished 5th, with Ian Harpur running the fastest anchor leg among 122 teams. 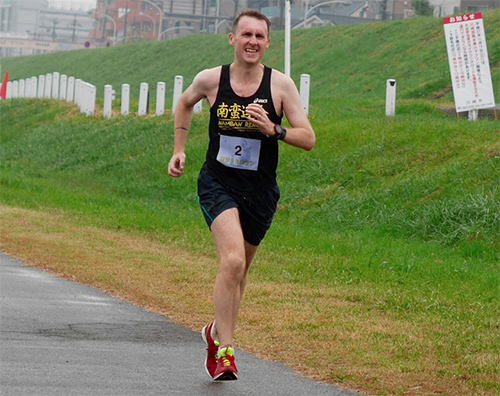 Since then, the speedsters have left Japan, but we have continued to enter three or four ekiden a year with several teams, always finishing well (about 20th to 50th among 200 or so teams) and having a lot of fun. 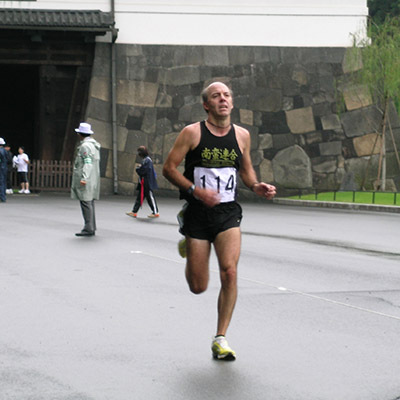 If you have never tried an ekiden, we hope you will have the chance to, either in Japan or wherever you live. 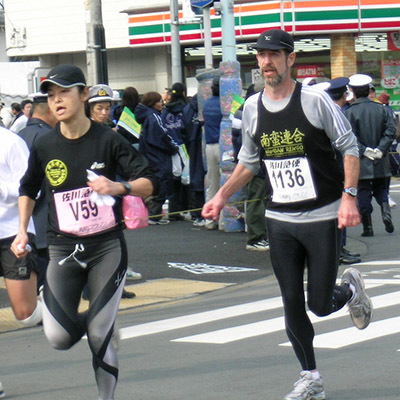 Naturally, Namban Rengo runners also participate in many other individual races throughout the year, with the most popular being the Tokyo Marathon in February. A list of members marathon PBs can be found here. What does Namban Rengo mean? Namban-jin was was the word applied to the Portugese sailors who were among the first western people ever to visit Japan. Literally, the term means southern barbarians. Rengo means union, association, etc. It is also used by gangster and biker groups, in which case the meaning is closer to gang. All things considered, a good translation of our club name is The Barbarian Horde. For further information please use the form to contact Chairman of the Horde Bob Poulson.